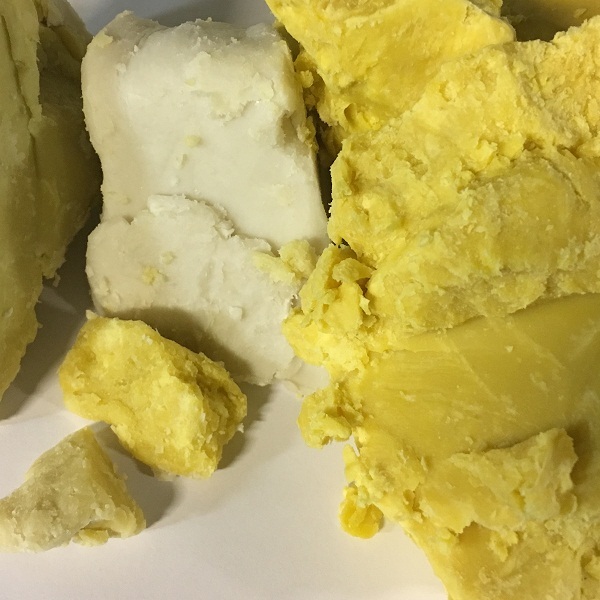 ColorThis Shea Butter is mostly yellow but can have white and lighter yellow chunks. This Shea butter is Very Creamy. "I bought both Refined and Unrefined Shea butters.. They are both smooth.. the Unrefined is more smooth and velvety, while the refined is more like the avocado butters.. I have melted them and made shaving balm for men and they are awesome!" This is the best shea butter I have ever purchased!! It does have some of the tiny granules in it since it is in its rawest form but it is so incredible and the price is so great, its worth a little bit of time for me to filter it myself since I use it in products I sell, such as lip balms and soaps. I never want to purchase it anywhere else! I am very please with this. I use it in a lot of my products. I fell in love with it creamy and smooth to the touch. This is the best one to buy. Best Organic Shea Butter around! Its non greasy,unlike the other shea butters i have purchased from various sellers which tend to be very oily and greasy.I threw all my other ones out,im sticking to Soapgoods shea buters.Love it!And did i mention the quick shipping? I will return to buy more goodies from Soapgoods soon. The quality of this shea butter seems quite excellent. It is very creamy and what I received smelled fresh. A couple things to be aware of, is that the color is very yellow, and in parts a greenish yellow. If you are using a large amount of this shea butter in a product that you intend to be white, you might want to consider purchasing one of the other shea butter options on this site. The other thing I noticed is a small amount of debris in mine. It was fine and dark colored, about the size of sand. But when everything was melted it sunk to the bottom of the pyrex measuring cup, so that when I poured my lotion bars into my molds, the debris (shell?) sunk to the bottom and stayed in the glass cup. If you notice debris in yours, just pour slowly and it may work fine without needing to filter. I ordered 4 pounds of this shea butter! Yum, I love it! I did not notice any debris. Some of it was fractured, but I think it is easy to melt and I don't mind it. Shea butter is perfect for any lotion, anti aging product, skin care, cancer prevention. Love it. I love this shea butter and use it all the time in my lotions and lip balms. However it does contain some debris so I will be trying a different one next time for comparison. "Very nice Shea Butter. I have used other ""unrefined"" shea butter in a can, and it was always a bit grainy. This is nice and creamy! And MUCH cheaper. It's very thick, if you want something for dry skin that's protective. This shea butter is nice and creamy and smells wonderful. I love it in my lotion bars. This shea is great stuff, I purchased with refined shea butter also. This Shea butter is AMAZING. It goes on smooth and has a delicate nut odor. It moisturizes so well...I can see my fine lines diminishing after 3 months of consistent use. I use it right out of the tub as an allover moisturizer. 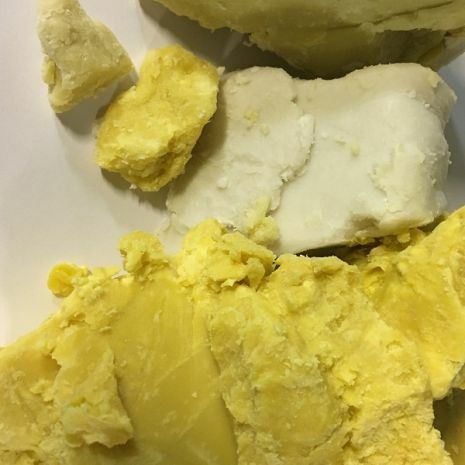 We use this shea butter for our body butter and beard wax products. It has a nice mild scent and melts really well. We love the way it feels and how easy it is to work with! This Shea Butter has a creamy feel to it. It is not hard at all. I mix mines with Alvocado oil, Coconut oil, Vitamin E oil, and Cocoa butter. I first melt all together except the vitamin E oil which I add once it had cooled some. I then begin whipping with a electric hand blender until it resembles whipped cream. Smells just like chocolate. My body and hair loves it. I use it for cuts, burns, extra moisture and hair styling. If melted and mixed with a vegetable oil and a fragrance, this can really be a treat. Try sweet Orange! This a a wonderful natural product. I made lotion bars with this and have had rave reviews! People that usually have problems with winter cracking and splitting tell me this has saved their hands and no more painful cracking. I will use in soap next can't wait! This is a really good shea butter. If you want something a little different in your products to help them stand out, this shea butter is the way to go. It feels and smells great! Brace yourself for the color though because it's really, really yellow.